Some places have good feelings, and some places have bad feelings. You usually know this feeling instantaneously when walking into a restaurant, sometimes even from the sidewalk. You feel good about going in, sitting down, relaxing in your chair, and enjoying your meal to come. Sometimes it even feels like you've been coming here for years when it's only your first time. Los Hermanos is the type of place with that uniquely good feeling from the moment you step in. It all takes place in what appears to be the waiting room of an old car wash that has been transformed into a tortilla factory. It's been around for some time as its current incarnation, but in the last couple years has been skyrocketing in fame, and I finally got around to checking it out. At the counter there are slips of paper that you can write down your order and hand to someone, but it is just as easy to call it out when the place is not too busy. Preparation is pretty quick, standard for this type of joint, but the surroundings create a good deal of fun to appreciate and happiness of the place is contagious. The best deal on the menu here and the winner for most care goes to the tostadas ($2.50 each, above), which are piled high lettuce, cheese, cream, and a slice of fresh avocado. The cecina (cured beef) and bistec (steak) are less moist and marinated than preferred but make for honest, hardy choices. Less satisfying are the tacos themselves (below). Even though this place is supposedly cranking out tortillas, these circular carriers were just as unfresh as most in the city. There is a whole world of $2 tacos in this city made from packaged tortillas and forgettable, but one shouldn't expect to find the gems in Bushwick I suppose, especially from a place that is mostly frequented by non-Mexicans. I would love to sample the food from here when it started serving to see if it has been altered and/or scaled back over the years due to shifting clientèle. A strong set of red and green salsas can make or break a taco joint sometimes. Unfortunately the kickstarters here do none of either and are lifeless afterthoughts. I do know however that my experience in this place was positive, and I would certainly return relatively often if it was around the corner from my house. It just has that vibe that goes with everything I like. It makes me want to tell everyone about it, but alas... they already know! I wish people would stop reviewing this dump. There are several excellent Poblano joints in Bushwick and this is NOT one of them. 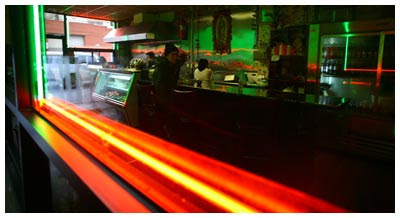 Taqueria El Paisa at Suydam and Irving is magnificent and you don't have to fight for a table and the view is nice.